This tutorial was written by me on 28 March 2009. Any similarities to other tutorials is purely coincidental. Tube of choice. I am using the adorable artwork of Suzanne Richards. I bought this tube when CILM was still open. You can find her art at CDO now. Sweet as Honey scrapkit by Cinnamon Scraps. If you wish to purchase this amazing scrap, you can here. Thank you, Laura!! Template 143 made by me which you can download from here. GG_Mask 25 made by me which you can get here. Bee animations of choice. I got mine from Peachie's Collection under bugs, page 9. Font of choice. I used BumbleBee BV which you can download here. Go to image > canvas size. Change the width to 800 and the height to 650. Highlight the white background layer. Floodfill with white. Highlight the 2 scalloped circles layer. Go to selections > select all. Selections > float. Selections > defloat. Open up a paper from the kit. Resize by 80%, smartsize. Copy and paste as a new layer onto your canvas. Go to selections > invert. Hit delete on your keyboard. Deselect (CTRL+D). Give the layer a drop shadow of H and V 0, Opacity 75, Blur 7.00. Delete the gray scalloped circles layer. Highlight the Copy of 2 scalloped circles layer and repeat the above steps. Repeat the gradient glow. Give the layer a drop shadow of H and V 0, Opacity 70, Blur 5.00. Delete the black circle shape. Highlight the stem flowers layer. Select, float and defloat. Open up a paper from the kit. Resize by 80%, smartsize. Copy and paste onto your canvas. Selections > invert. Hit delete and deselect. Give the layer a drop shadow of H and V 0, Opacity 70, Blur 5.00. Delete the gray stem flowers layer. Highlight the 2 daisies layer. Select, float and defloat. Open up a paper from the kit. Resize, 80%, smartsize. Copy and paste onto your canvas. Selections > invert. Hit delete and deselect. Give the layer a drop shadow of H and V 0, Opacity 70, Blur 4.00. Delete the gray 2 daisies layer. Highlight the copy of 2 daisies layer. Repeat the above steps. Highlight the little gray flower layer. Select, float and defloat. Open up a paper from the kit. Resize by 80%, smartsize. Copy and paste onto your canvas. Selections > invert. Hit delete and deselect. Give the layer a drop shadow of H and V 0, Opacity 70, Blur 4.00. Delete the little gray flower layer. Highlight the copy of little gray flower layer and repeat the above steps. Grab your magic wand tool, tolerance set at 30, feather set at 0.00. Click inside the empty space of the frame. Go to selections > modify > expand by 4.00. Open up a paper from the kit. Resize by 65%, smartsize. Copy and paste onto your canvas. Position to your liking within the selection. Selections > invert. Hit delete. Don't deselect yet. Open up a tree from the kit. 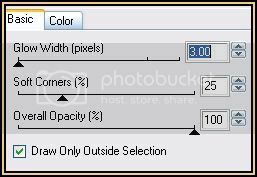 Resize by 30%, smartsize. Copy and paste onto your canvas. Position to your liking within the frame. Hit delete. Don't deselect!! Open up a bumble bee bear. Resize by 45%, smartsize. Copy and paste on to your canvas. Position to your liking within the selection. Hit delete. Deselect. Apply Gradient Glow to the bear (same settings as before) Give the bear a drop shadow of H and V -2, Opacity 60, Blur 4.00. Highlight the frame layer. Drag it to the top of your layer palette. Duplicate the frame. Position it across from the other frame (see my tag for reference). Duplicate the frame paper. Position it in the duplicated frame. Select, float and defloat the paper. Open up another bumble bee bear from the kit. Resize by 45%, smartsize. Copy and paste onto your canvas. Position within the frame and hit delete. Deselect. Apply Gradient Glow to the bear, and give it the same drop shadow you gave the other bear. Duplicate the tree. Mirror the tree. Position it behind the bear. Give both frames a drop shadow of H and V 0, Opacity 70, Blur 6.00. Open up 2 flowers from the kit. Resize one ny 25%, smartsize, and the other by 20%, smartsize. Copy and paste them both onto your canvas. Give both flowers a drop shadow of H 2, V 0, Opacity 65, Blur 3.00. Position the flowers to your liking on the left round frame. Duplicate both flowers. Mirror the duplicated flowers. Position them on the right frame. Open up a butterfly of choice. Resize by 30%, smartsize. Copy and paste onto your canvas. Go to image > free rotate. Rotate the flower left by 25.00, both boxes unchecked. Go to adjust > sharpen. Give the butterfly a drop shadow of H and V -2, Opacity 65, Blur 4.00. Duplicate the butterfly. Go to image > mirror. Position the butterflies to your liking on the frames. Open up a bow from the kit. Resize by 20%, smartsize. Copy and paste onto your canvas. Give it a drop shadow of H and V 0, Opacity 50, Blur 4.00. Duplicate the bow. Go to image > mirror. Position the bows to your liking on the stem flowers. Open up a blossom from the kit. Resize by 45%, smartsize. Copy and paste onto your canvas. Give it a drop shadow of H and V 0, Opacity 45, Blur 6.00. Go to image > flip. Duplicate the blossom. Go to image > mirror. Position them as in my tag above. Open up cloud 2 from the kit. Resize by 55%, smartsize. Copy and paste onto your canvas. Give it a drop shadow of H -3, V-2, Opacity 70, Blur 4.00. Duplicate the cloud. Mirror the duplicate cloud. Position the cloud benath the top scallope circle layers. Move them a little to the side and above the scalloped circles so they can be seen. (see my tag for reference. Open up cloud 1 from the kit. Resize by 65%, smartsize. Copy and paste onto your canvas. Give it a drop shadow of H and V 0, Opacity 70, Blur 6.00. Position in between the other two clouds. Merge the 3 cloud layers together. Duplicate the merged clouds. Go to image > flip. Position them as im my tag above. Make certain that both cloud layers are behind the blossom layers. Open up tree1 from the kit. Resize by 55%, smartsize. Copy and paste onto your canvas. Give the tree a drop shadow of H 2, V -2, Opacity 70, Blur 5.00. Duplicate the tree. Go to image > mirror. Position them as in my tag above. Make certain both tree layers are on top of the cloud layers. Open up the sun from the kit. Resize by 55%, smartsize. Copy and paste onto your canvas. Apply Gradient Glow, same settings as before, using a bright yellow. Give the sun a drop shadow of H and V 0, Opacity 45, Blur 6.00. Positon it below the top middle cloud, so that the top of the sun is peeking out frombehind the cloud. Open up the bee from the kit. Resize by 30%, smartsize. Copy and paste onto your canvas. Go to image > free rotate. Rotate left by 40.00 degrees, both boxes unchecked. Go to adjust > sharpen. Give the bee a drop shadow of H and V 1, Opacity 65, Blur 2.00. Duplicate the bee. Go to, image > mirror. Duplicate the mirrored bee. Go to image > flip. Duplicate the flipped bee. Go to image > mirror. Positon the bees as in my tag above. Hide your white background. Merge your visible layers. Resize your merged layer by 85%, smartsize. Open up your tube. Resize as necessary, bicubic. Copy and paste onto your canvas. Give your tube a drop shadow of H and V 0, Opacity 65, Blur 10.00. Arrange your tube to your liking. Delete the mask, answer yes and merge the group. Resize the mask by 90%, smartsize. Duplicate the mask 2 times. Merge the 3 mask layers together. Apply FM Tile Tools Blend Emboss with the default settings. If you are animating, merge all of your layers together. Copy. Open up Animation Shop. Paste as a new animation in AS. Open your animation of choice. Note the amount of frames of the animation. Duplicate your tag animation frame until you have the same amount of frames as your chosen animation. Highlight your bug animation. Select all frames (CTRL+A) Go to Edit > Copy. Highlight your tag animation. Select all frames (CTRL+A) Go to Edit > Paste into selected frame. Position the animation to your liking and left click your mouse. Paste the animation(s) as many times as you like onto your tag animation. I hope you enjoyed this tutorial! If you have any questions, email me or give me a shout.